Jose Altuve of the Astros is Box-Toppers Player of the Game in World Series Game 5 Sunday. The Houston Astros beat the Los Angeles Dodgers 13-12 in 10 innings to take a 3-2 lead in the best-of-seven series. Altuve hit a three-run homer and doubled, going 3-for-5, scoring three times and driving in four runs. He had a Box-Toppers game score of +5.0, highest among Astros players. The Astros used seven pitchers, only one of whom had a positive Box-Toppers game score. That was reliever Luke Gregerson, who had a Box-Toppers game score of +1.1 (0.1IP 0H 0R 0BB K ND), who relieved starter Dallas Keuchel in the fourth inning and picked up one out. Keuchel had the second-lowest Box-Toppers game score among Astros players of -6.8 (3.2IP 5H 4R 3ER 2BB 4K ND). Reliever Chris Devenski, who blew the save in the ninth inning and allowed the Dodgers to tie the game 12-12, had the lowest Box-Toppers game score among Astros players of -7.9 (1.1IP 3H 3R BB K ND). Dodgers starter Clayton Kershaw had the lowest Box-Toppers game score of any player in the game of -12.8 (4.2IP 4H 6R 3BB 2K ND). Reliever Brandon Morrow, who appeared for the Dodgers in the seventh inning and blew the save, had a Box-Toppers game score of -12.0 (0IP 4H 4R 0BB 0K ND). Closer Kenley Jansen, who picked up the loss, had a Box-Toppers game score of -2.8 (1.2IP 2H R BB K L). During the regular season, Altuve had only 2.5 Box-Toppers points, earning Player of the Game honors in just two Astros wins in 2017. However, in 2016, he had 12.5 points and ranked third among American League batters. It is the second time this postseason Altuve has earned Player of the Game honors. He was also Player of the Game in the American League Division Series Game 1 win over the Red Sox on Oct. 5. Altuve is the seventh player—and second batter—to earn Box-Toppers Player of the Game honors twice in the postseason. He joins teammates George Springer, Justin Verlander and Dallas Keuchel, plus Kenley Jansen and Yu Darvish of the Dodgers and Masahiro Tanaka of the Yankees. The series resumes with Game 6 Tuesday in Los Angeles. About Box-Toppers—Box-Toppers tracks who most helps their team win the most games. 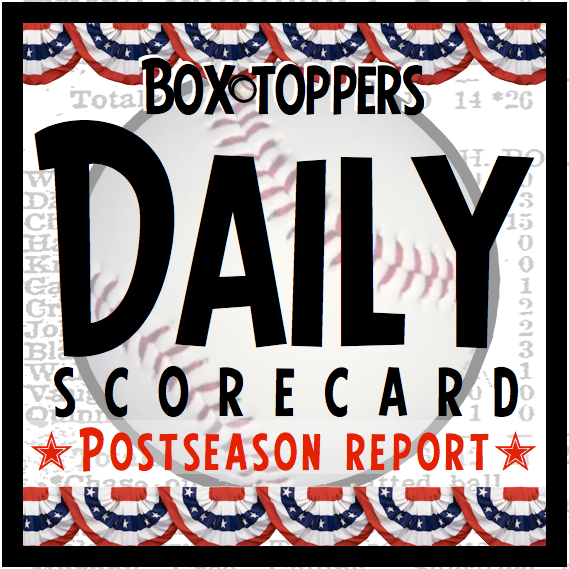 Using standard box score statistics, Box-Toppers uses a simple formula to determine a Player of the Game for each Major League Baseball game played. That player is the person who contributed most to his team’s win. In regular season games, players earn 1.0 Box-Toppers point for being named Player of the Game and can earn bonus points for being Player of the Day or top player or batter in their league for the day. Box-Toppers strives for accuracy. See a mistake in a post? A wrong name, wrong team, grammar error, spelling goof, etc.? Thanks for pointing it out! Contact Box-Toppers here. Let's fix it and make it right. Astros—Justin Verlander, 14.7 Box-Toppers points, ranked 16th among all players, sixth among AL pitchers. Dodgers—Rich Hill, 12.7 Box-Toppers points, 21st among all players, 12th among National League pitchers. It is a rematch of Game 2 won by the Astros 7-6 in 11 innings on Oct. 25. Player of the Game was neither Verlander nor Hill, but George Springer of the Astros (HR 2B 3-5 R 2BI) with a Box-Toppers game score of +1.0. Verlander (6IP 2H 3R 2BB 5K ND) had a Box-Toppers game score of +1.0, but was beaten by Springer because in cases of game score ties, batters rank ahead of pitchers. Hill had a higher Box-Toppers game score (+3.0) but his team lost, so he did not earn Player of the Game (4IP 3H R 3BB 7K ND). While neither of Tuesday’s starters earned Player of the Game in Game 2, Verlander has earned Player of the Game twice in the 2017 postseason and Hill has earned the honor once. AL Division Series Game 1 on Oct. 6—Verlander started and had a Box-Toppers game score of -3.0 (6IP 6H 2R 2BB 3K W) in the 8-2 win over the Red Sox. He did not earn Player of the Game, which went to teammate Jose Altuve with a Box-Toppers game score of +5.0. ALDS Game 4 on Oct. 9—Verlander, appearing in his first career relief appearance, had a Box-Toppers game score of -2.8 (2.2IP H R 2BB 0K W). Player of the Game went to teammate George Springer, who had a Box-Toppers game score of +1.0. AL Championship Series Game 2 on Oct. 15—Verlander had a Box-Toppers game score of +14.0 (CG 5H R BB 13K W) in the 2-1 win over the Yankees, earning Player of the Game honors. ALCS Game 6 on Oct. 20—Verlander had a Box-Toppers game score of +9.0 (7IP 5H 0R BB 7K W) in the 7-1 win over the Yankees, earning Player of the Game honors. NLDS Game 2 on Oct. 7—Hill started and had a Box-Toppers game score of -2.0 (4IP 3H 2R 3BB 4K W) in the 8-5 win over the Diamondbacks. Player of the Game was teammate Kenley Jansen with a Box-Toppers game score of +3.2. NLCS Game 2 on Oct. 15—Hill started and had a Box-Toppers game score of +7.0 (5IP 3H R BB 8K ND) in the 4-1 win over the Cubs, earning Player of the Game honors.